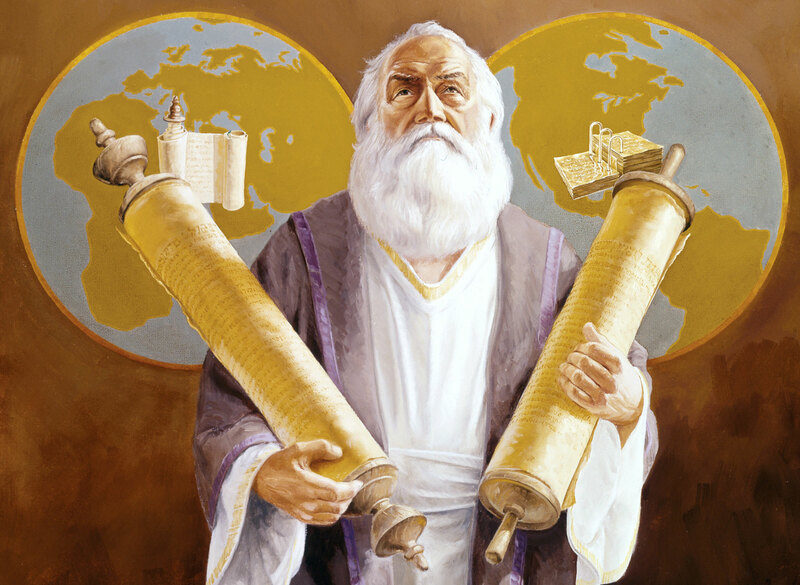 The Prophet Ezekiel holding the records of two nations. Artwork by Lyle Beddes, via LDS Seminary Files. Nephi anticipated some of the objections latter-day readers may have against the Book of Mormon. Some might exclaim, “A Bible! A Bible! We have got a Bible, and there cannot be any more Bible” (2 Nephi 29:3). In response to this criticism, Nephi emphasized that God may speak to whomever He pleases, and when He does, the records produced by those people so spoken to will be beneficial to His children. “Wherefore murmur ye, because that ye shall receive more of my word?” Nephi presented the Lord asking rhetorically, “I speak the same words unto one nation like unto another. And when the two nations shall run together the testimony of the two nations shall run together also” (2 Nephi 29:8). Nephi’s mentioning of the testimony of “the two nations” that would “run together” brings to mind the passage in Ezekiel 37 well-known to Latter-day Saints. “The word of the Lord came again unto me, saying, Moreover, thou son of man, take thee one stick, and write upon it, For Judah, and for the children of Israel his companions: then take another stick, and write upon it, For Joseph, the stick of Ephraim, and for all the house of Israel his companions: And join them one to another into one stick; and they shall become one in thine hand” (Ezekiel 37:15–17). Latter-day Saints have traditionally interpreted the two sticks (in Hebrew literally “tree” or “wood”) as being the Bible and the Book of Mormon. Looking further at the context of Ezekiel 37, one finds that these sticks are symbolic of the tribes of Israel being consequentially reunited and restored.1 “And I will make them [the sticks of vv. 16–17, 19] one nation in the land upon the mountains of Israel; and one king shall be king to them all: and they shall be no more two nations, neither shall they be divided into two kingdoms any more at all” (Ezekiel 37:22). After the days of Solomon, Israel divided into two kingdoms—the Kingdom of Judah in the south, and the Kingdom of Israel in the north, where the lands of Ephraim and Manasseh (sons of Joseph) were found. Lehi was from the tribe of Manasseh. Prophets such as Ezekiel, who was taken from Jerusalem to Babylon shortly after the time when Lehi departed into Arabia, looked forward to a time when all the broken parts of the two kingdoms of Israel would be reunited, physically and spiritually. Nephi specifically stressed that the Jews and the Nephites would both produce records (the Bible and the Book of Mormon, respectively) that would come together to “show unto them that fight against my word and against my people, who are of the house of Israel, that I am God, and that I covenanted with Abraham that I would remember his seed forever” (2 Nephi 29:14). This covenant included the promise that Abraham’s seed would become great, receive the gospel of salvation, and inherent a land of promise (Genesis 17:1–8; Abraham 2:9–11). The Bible and the Book of Mormon together affirm that this will in some way transpire for modern remnants of the House of Israel. 1. Hugh Nibley, An Approach to the Book of Mormon, The Collected Works of Hugh Nibley: Volume 6 (Salt Lake City, UT and Provo, UT: Deseret Book and FARMS, 1988), 311–328; Keith Meservy, “Ezekiel’s Sticks and the Gathering of Israel,” Ensign (February 1987); “Ezekiel, Prophecies of,” in The Encyclopedia of Mormonism, 4 vols., ed. Daniel H. Ludlow (New York: Macmillan, 1992), 1:480–81; “Ephraim, stick of/Joseph, stick of,” in Book of Mormon Reference Companion, ed. Dennis L. Largey (Salt Lake City, UT: Deseret Book, 2003), 246–47; Kevin Barney, “OT: Ezekiel’s Sticks,”. 2. See Bruce A. Van Orden, “The Law of Witnesses in 2 Nephi,” in Second Nephi, The Doctrinal Structure, ed. Monte S. Nyman and Charles D. Tate Jr. (Provo, UT: Religious Studies Center, Brigham Young University, 1989), 307–21. 3. The topic of witnesses in biblical law is complex. For an overview, see Bruce Wells, The Law of Testimony in the Pentateuchal Codes, Beihefte zur Zeitschrift für Altorientalische und Biblische Rechtsgeschichte 4 (Wiesbaden: Harrassowitz Verlag, 2004). John W. Welch has explored the ramifications of biblical law for the Book of Mormon, including the law of witnesses, in John W. Welch, The Legal Cases in the Book of Mormon (Provo, UT: Brigham Young University Press and the Neal A. Maxwell Institute for Religious Scholarship, 2008), passim. On the use of divine witnesses in an ancient Israelite religious setting that is directly relevant to the Book of Mormon, see generally David E. Bokovoy, “‘Thou Knowest that I Believe’: Invoking the Spirit of the Lord as Council Witness in 1 Nephi 11,” Interpreter: A Journal of Mormon Scripture 1 (2012): 1–23; “Invoking the Council as Witness in Amos 3:13,” Journal of Biblical Literature 127, no. 1 (2008): 37–51; Stephen O. Smoot, “The Divine Council in the Hebrew Bible and the Book of Mormon,” Studia Antiqua: A Student Journal for the Study of the Ancient World 12, no. 2 (Fall 2013): 15–16 n. 62.